Happy New Year! We will like to wish all a year full of joy, good health and blessings. 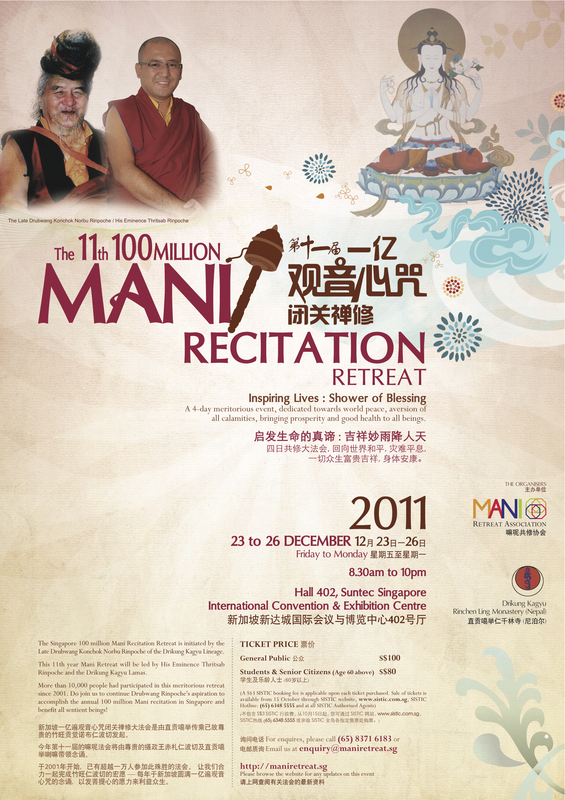 The Mani Retreat Association, in collaboration with Drikung Dharma Chakra Centre, is very honored to be able to invite His Eminence Thritsab Rinpoche back to Singapore in Feb 2012 to lead us in a series of practices. We hope that you and your loved ones will be able to join us in the following events. Please refer to the attached poster for the event details. Venue: Poh Ming Tse Temple. 438, Dunearn Road, S(289613). Free Admission. Registration is required as meals will be provided. Seats are limited, please register early. 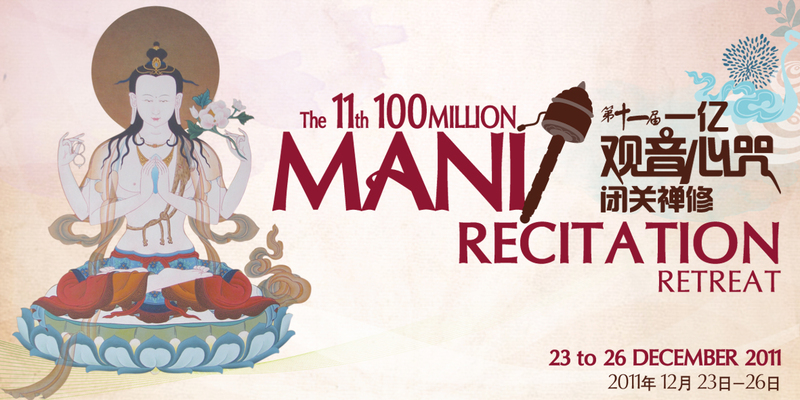 We would like to encourage everyone to continue your Mani mantras recitations diligently. Please submit your Mani recitation counts to us with your name and contact electronically or through phone-call by 3rd Feb 2012. 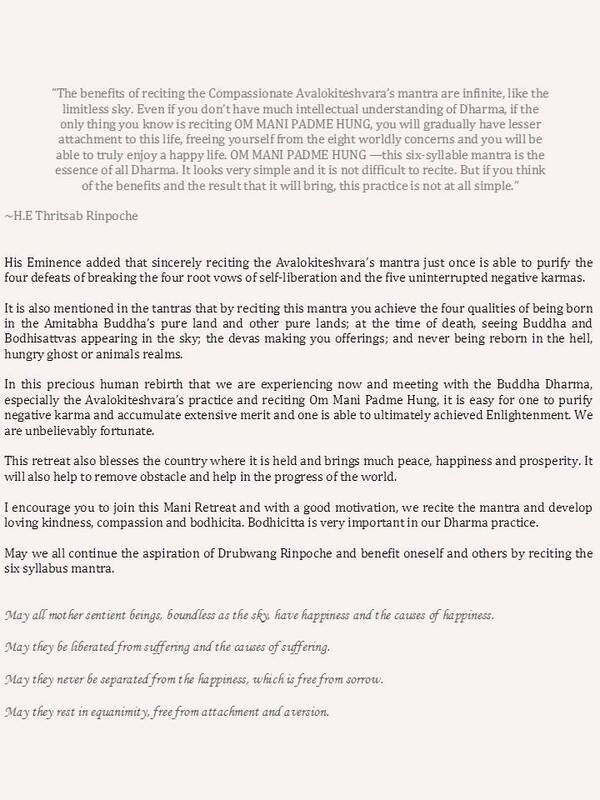 May the merits accumulated from the recitations bring world peace, prosperity and good health to all beings. The total number of ‘live’ recitations and contributions from participants at home and around the world is 67,733,188 (as of 6pm on 26 Dec 2011). This number has been confirmed by an independent group of counters and auditors selected from within the retreat participants at the beginning of the retreat. Though at the present moment, we still fall short of the targeted 100 million recitations, it was nonetheless an excellent effort by each and every one of you. Let’s give ourselves a round of applause for all the effort that we have put in over the last 4 days. Really, there is no cause for despair or disappointment. Recall, at the beginning of this retreat, we have highlighted that speed of recitation isn’t our primary concern. Also in H.E. Drubwang Rinpoche’s teachings, He has taught that it is more important to pronounce every syllable of the mantra clearly. You may have notice the intentional slow down in our recitation speed for this year’s retreat. This is in hope that every participant will be able to keep up with the recitation and pronounce the mantra completely and clearly, eventually internalizing the mantra in our hearts. As the recitation period will be spread over the New Year, I hope that the merits from the recitations will bring many blessings to you, your family and all sentient beings in the coming year. On behalf of the Mani Retreat Association, I would like to convey our sincere thanks to His Eminence Thritsab Rinpoche and the group of Drikung Kagyu lamas who have selflessly led and guided us throughout the duration of this retreat. We would also like to thank Suntec City. Without their support, conducting the retreat at this convenient location would not be possible. The Mani Retreat Association is also grateful to the group of generous sponsors. Your donations have certainly helped to ensure this event’s success. We would also like to thank our dedicated volunteers for giving their time and energy to support this event. And of course, THANK YOU to all participants. Without all of you and your sincere efforts, this event will not be possible and successful. Thank you. The Mani Retreat Association committee members would also like to sincerely apologise for any inconveniences we have caused anyone in the process of planning for and during the retreat. We will strive to do better next time. His Eminence Thritsab Rinpoche Arrival Schedule to Singapore. All are welcome to receive His Eminence Thritsab Rinpoche at the airport.